Say hello to the what's coming to OK Acres from Crosswinds Farm this fall. He's lost one of his scurs in this photo, but that's ok, he can shed that other one too and I won't be a bit upset. (grin) I have become a bit "moorit heavy" at my place and I think this little guy will help rectify that situation nicely. The fact that I had a mioget and moorit rams last year seems to be the cause of that. Breed moorit to moorit, and what do you get? hmmmmmm..........Moorit??? (big grin) The super duper bonus here is that Thor is a poll carrier. I still love the look of those majestic horns on a nice ram, but my buildings and gates are grateful for the transition to hornless sheep. 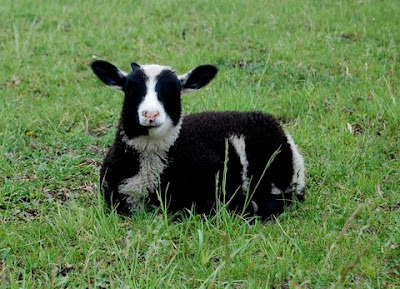 With 2 spotted rams, I'm hoping to have an entire pasture full of flashy lambs in 2012. I cannot believe that I just suggested that I'm thinking of spring 2012 already. sheesh. Corinne always has wonderful sheep to offer and this year is no exception. Her honesty and integrity make purchasing Shetlands a extremely pleasant experience. Thank you Corinne for letting Thor come to OK Acres!!! I need you to send a nice, fine-fleeced moorit out with Garrett to BSG! I'm looking at what I have and WILL have once the Great Sheep Shuffle of 2011 is over, and am worried about having too much black -- and white (unfortunately, not on the same sheep like you're getting). Wow! He looks amazing! I think I'll send my ewes over to your place to be bred! :-) I love his markings and the fleece looks single coated. I'm glad you like him, Kelly : ). I really like the name!! !